This is one of several apartment buildings constructed in 1928-29 in the 1100 block of 17th Avenue, all similar in massing and scale but reflecting a variety of international styles. The Martha Anne was designed by the prominent firm of Schack & Young, for developers Mackintosh and Owsley. It is particularly notable for its Art Deco art glass windows and the terra cotta surround at the entry. Other buildings in this block, often known as International Village, are the Fleur de Lis (French), Barbara Frietchie, Carmona (Mediterranean Revival), Mayfair Manor, Margola (with Mayan detailing) and Betsy Ross. They are in vivid contrast to the more typical brick-clad buildings with Tudor- or Gothic inspired terra cotta ornament. Architect James Hansen Schack, a native of the Schlesweg region of Germany, Schack arrived in Seattle in 1901 after receiving architectural training at various Chicago firms. He was a partner of Daniel Huntington from 1907-09, primarily designing apartments, commercial buildings and residences, as well as the First United Methodist Church in downtown Seattle. He is best known, however, for his later partnership with David Meyers and Arrigo Young, which began in 1920. The firm designed the Seattle Civic Auditorium complex, the town of Longview and numerous residences and commercial buildings. Myers left the firm about the time this building was designed. The firm remained in existence until the 1990s. These buildings, all built within one year, are good examples of the major construction Seattle experienced during the 1920s. The city's population had increased dramatically in previous decades, and prosperity encouraged developers to meet the pent-up demand for housing. Apartments, ranging from basic housing to luxury units, were a significant factor in meeting this need, and became a major element of the streetscape in many Seattle neighborhoods. This is a fine example of the design attention paid to many of these buildings, where detailing and materials were used to reduce the impact of larger structures. This neighborhood, known as Renton Hill, had been the site of many fine homes early in the century. By the late 1920s many of those houses were becoming multifamily, and apartment buildings were being built. The area was especially attractive for its views and the convenient Madison Street car line to both downtown and Lake Washington. This three-story apartment block is distinguished by the entry bay in the center, clad with terra cotta and featuring three tall, narrow stained glass windows in colorful geometric Art Deco motifs. Below are three small windows with similar designs. The doorway has a wide surround with an exuberant Art Deco floral design. 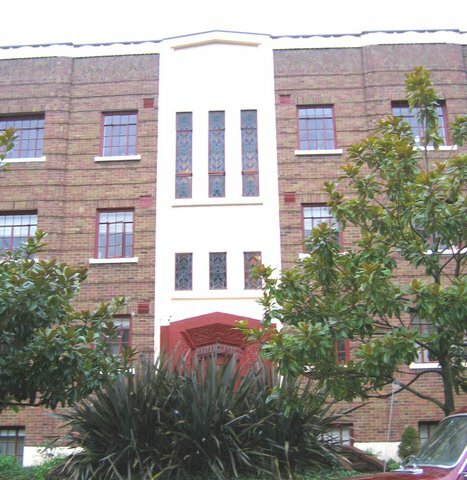 The remainder of the building is clad with red brick with Zig Zag Moderne detailing. Windows are all 16-light steel sash with an operable casement section in the center.